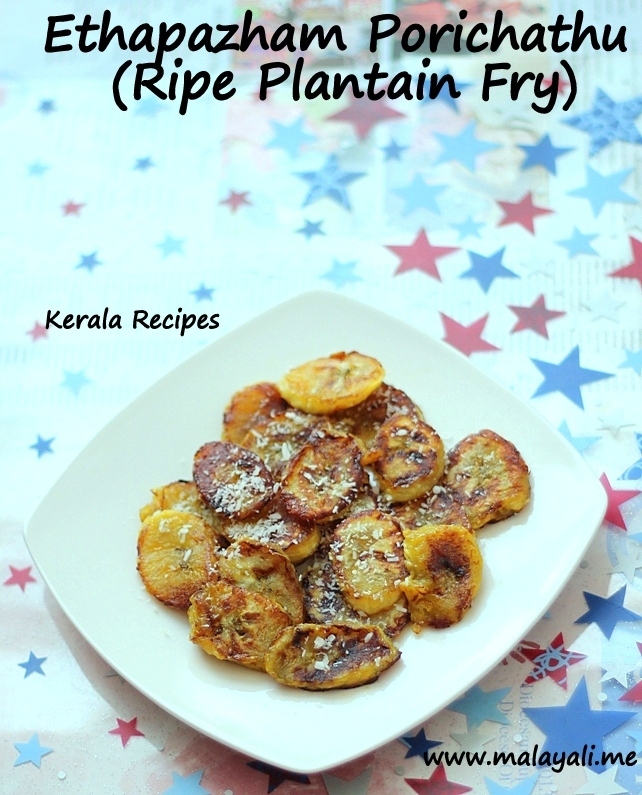 The easiest and yummiest snack I have ever eaten is Ethapazham Porichathu (Ripe Plantain Fry). Growing up in Kerala, Plantains were something we ate almost daily. I often took Plantains for granted and only began to miss it when I moved outside Kerala. I cannot even call this a recipe but the simple step of frying plantains caramelizes it and it tastes so good. I would urge you to try this recipe if you have ripe plantains. This tastes best when you use plantains that are really ripe, the skin should be almost black with very little yellow. Peel the plantain and dice it into 1/4″ to 1/2 ” thick pieces. Heat oil/ghee in a non stick frying pan or skillet. Arrange the diced plantain pieces in a single layer in the pan. Fry each side for 2-3 minutes so that that edges are browned. Remove and arrange it on a plate. Sprinkle dessicated coconut on top. Serve immediately. I prefer the taste of coconut oil to ghee though traditionally, this snack is prepared in ghee. If the plantain pieces are thin, they may become mushy. A few of my pieces were thin and became slightly mushy while flipping.